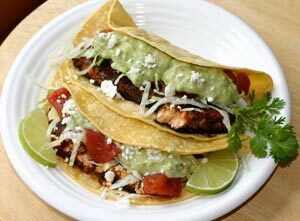 Have you ever tried a fish taco recipe? You really won’t know how good it is until you give this one a try. Not only is it healthy but it’s delicious. These Baja fish tacos call for marinating the fish before grilling and then serving them in warm corn tortillas topped with a wonderful creamy avocado sauce. This recipe calls for firing up the BBQ now that the weather is getting warmer. Heck, you could have a Cinco De Mayo party and serve this recipe with some rice and beans and you’ve got a great meal. Oh yeah, you’ll probably want to serve some margaritas too. 2 lbs. of fish (cod, halibut, red snapper or shark work well). Plan on 1/4 to 1/3 lb of fish per person, depending on what else you are serving. Marinate the fish in a dish or zip lock bag and place in the refrigerator for 20 minutes to 2 hours. Mix the mayonnaise, sour cream, and avocado with a masher in a bowl. Then add the apple cider vinegar, garlic powder, scallions, Chile powder, lemon juice and salt and mix well. Fold in the cucumber chunks. Cover and place in the refrigerator until needed. Just before you start grilling, wrap 12 corn tortillas in foil and place in a 250 degree oven. Let me just mention that if you don’t want to, or can’t BBQ the fish, you can just saute in on the stove. BBQing gives it a nice flavor and keeps the calories low. Before you put the fish on the barby, brush the grate with oil to keep the fish from sticking. I used canola oil but any will do. Fish cooks quickly depending on how thick the pieces are. It’s done when the flesh is flaky. Avoid over cooking the fish as this will dry it out. It usually takes about 5 to 6 minutes per side. Turn the fish over carefully so as to not lose it through the grate. When the fish is done, place it on a platter and cover to keep warm. Take the tortillas out of the oven and place two on a plate slightly over lapping each other. Break the fish apart into chunks and remove any noticeable bones. Spoon some fish onto the center of the tortilla. Add a couple of tablespoons of avocado sauce on top of the fish. Sprinkle cabbage and cheese on top and fold the tortillas over. You could also bring all the fixing’s out to the dinner table and invite your guest to make their own. Don’t forget to serve rice, beans, and margaritas for a complete and festive meal. This fish taco recipe will make about 6 servings. Ready To Try Another Fish Recipe?